Spartacon 2019 was held in Lansing, Michigan, on Saturday, January 12, 2019. 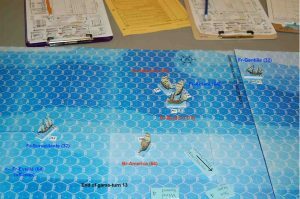 I ran a scenario of Close Action (from Clash of Arms games) there, using the Rebel Seas scenario 13, entitled “Winter Interception.” This scenario was from January 21, 1781, during the American Revolutionary War vs. England, and had a total of seven ships, three British and four French. Basically, the French have two 32-gun frigates, the Gentille and Surveillante, plus two 64-gun ships-of-the-line (SOL), the Eveillé and Ardent (the Ardent being an ex-British ship). The French can win by exiting all four of their ships off the far end of Map A, but a complication is that none of their ships can lose more than one of their rigging sections (each ship has four rigging sections). Else, the scenario would be won by which side caused more damage to the other. In opposition, the British have the 50-gun Adamant, the 64-gun America, and the 74-gun Bedford to try to stop the French. Jim Robinson was the French commander aboard Eveillé, and Joel Lauder commanded the British side from the deck of the Bedford. In the above picture, the French ships are in the order Gentille, Surveillante, Eveillé, and Ardent. They are indicated by the blue text, and are heading towards the left narrow side of the map. The British Adamant is near the edge that the French are heading towards, and the America is almost in the exact center of the mapboard, heading towards the French on an angle. 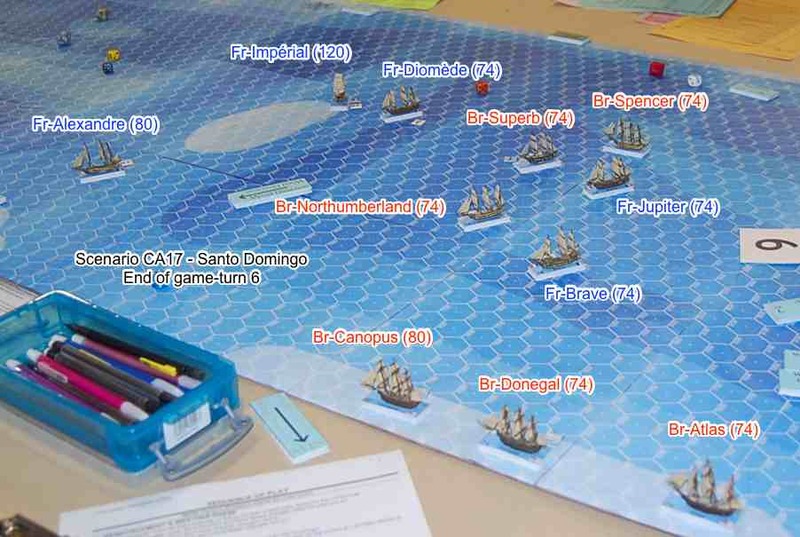 The British ship Bedford is off the map, and won’t appear on the map until game-turn 5 (aka g-t 5) of the scenario. All of the ships on the board at start are flying medium sails. In the above hex locations, “A” or “B” gives the map board the ship started on. In the above picture, Map A is the near map, and Map B is the map that is farther away. Then the hex number is given for that map (example: “2445”) which tells which hex that ship’s bow is placed in. And then, since each ship’s counter covers two hexes, we need to know which way the ship is pointing. The number after the colon (example: “:3”) tells us which way the ship is pointing. The maps have a compass “rose” printed on them. Direction “1” is pointing directly towards the near narrow map edge (off the near side of the table). Direction “2” is one hex clockwise from Direction 1, etc. The wind is blowing toward direction 5, sort of from the near-left corner toward the far-right corner of Map A. There are a couple of complications with this situation. Although the Wind Speed = 4 (high winds), the America is sailing “close-hauled” into the wind. But the America is flying “medium sails” and so can move four hexes in that wind attitude. 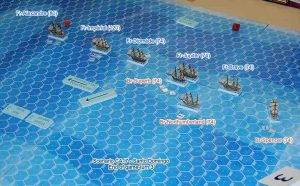 But the danger is if that one British ship tries to intercept the French by itself — the four French ships could gang up on the solo Brit and cripple her before the other British ships come up to do battle. Also, with the high winds come high seas (Sea State = 4). This means that all of the ships other than the two frigates will lose some gunnery factors when they are firing their guns downwind, due to having to close the lowest deck’s gun ports to keep the high waves from flooding into the ships. Also, the French are also sailing close-hauled into the wind, and that will slow their progress. 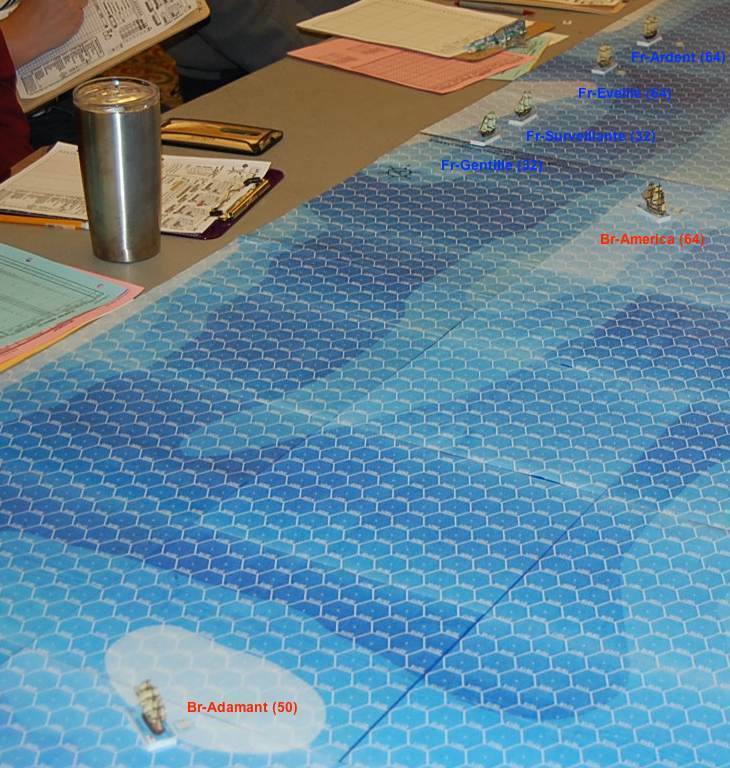 Their two 64-gun SOLs can only move 4 hexes per game-turn in that heading, although their two 32-gun frigates can move 5 hexes at medium sail in that heading. During game-turn 1, Gentille moved ahead 2 hexes, Surveillante moved ahead 3 hexes, Eveillé moved ahead 4 hexes, and Ardent also moved ahead 4 hexes. Adament turned 60-degrees to port (due to the limitations of the hex-grid) and then moved ahead 4 hexes. 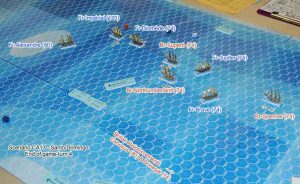 America moved ahead 4 hexes to close the range towards the enemy. Ardent and Eveillé placed “men in rigging” markers to show they were changing from medium sail to some other sail state. A casual observer would probably think they were going to put up more sails, to go to “plain sail” status, to increase their movement allowance. On the British side, both Adamant and America also placed “men in rigging” counters. No ships fired on g-t 1. The French flagship, Eveillé, signalled to the French fleet: “CLOSE UP THEN COMBINE”. During game-turn 2, Gentille and Surveillante each moved 2 and 3 hexes straight ahead, respectively, the same as in game-turn 1. Eveillé and Ardent each moved 4 hexes ahead, to try to close the gap between them and their leading frigates. 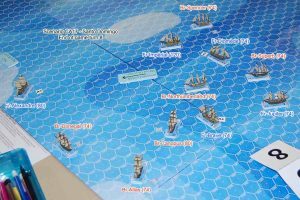 The British Adamant moved four hexes ahead. as did America. Eveillé and Ardent still had men in their rigging, as did Adamant and America. 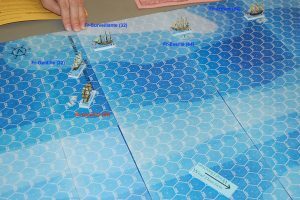 On this turn, the two French frigates also showed men-in-rigging. So all of the ships on the map were changing the status of the sails. Once again, there was no gunfire. At the end of the game-turn, during the maintenance phase, the ships announced their new sail status. Gentille and Surveillante had gone to “fighting sail,” meaning they were flying the minimum amount of sails so as to minimize any damage they might receive from enemy fire. Eveillé and Ardent had gone the other way, to “plain sail” and were now flying as many sails as they could get aloft, so to increase their movement allowance. On the British side, both Adamant and America were now flying plain sail. It should be noted that changing sails requires either one or two crew sections to be plotted to accomplish that task, depending on what sail-state the ship is changing to. Also, the amount of time is slightly variable per ship, depending on the quality of a ship’s crew. Better quality crews can change sails faster than lower quality crews. Quelle surprise, n’est-ce pas? The map after game-turn 2. The America has closed the range towards the French, and the Adamant (in the foreground) has turned to port to try to get in front of the French. The French flagship, Eveillé, signalled to the French fleet: “FIRE WHEN YOU CAN”. 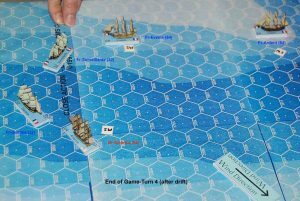 During g-t 3, both British ships could now move faster while close-hauled toward the wind due to their increased amount of sails, and Adamant and America both moved 6 hexes ahead. Gentille, the leading French frigate, plotted and moved “P3” which means she turned to port, then moved ahead 3 spaces. While the turn to port put Gentille into a more favorable wind attitude of a “broad-reach,” ships are limited by acceleration and deceleration factors from one turn to another. A large sailing warship just can’t accelerate like a race horse! This turn put Gentille on a near-collision course with America. Surveillante was content to just move ahead 3 hexes. Eveillé moved ahead 6 hexes, and Ardent moved ahead 5 hexes. Adamant declared “men in rigging” again, as did Eveillé and Ardent. America also had men in her rigging. Gentille and America head towards each other. Neither of those ships can bring their guns to bear on each other in this game-turn. 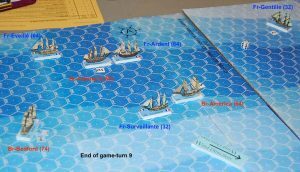 While Gentille and America were near each other, neither ship could fire at the other; however, Surveillante could bring her guns to bear on America, and so Surveillante, commanded by Bill Worrel (playing in his first game of Close Action), opened fire at a range of 6 hexes. At a 6-hex range, Surveillante had a “7” as its Basic Gunnery Number (BGN). It got to add a “+2” for its Crew Quality (CQ) Gunnery Modifier, to give her a Modified Gunnery Number (MGN) of “9”, but was just out of range to get a “rake” or an initial broadside bonus to her gunfire. The result of the gunfire was that America lost 2 rigging boxes (out of 6) in her first rigging section, and also lost a crew box from her marines. So Surveillante had the honor of drawing “first blood” even though the wound was only a “dice wound.” All ships were too far away for any shipboard marines to fire at each other. The French flagship, Eveillé, signalled to the Surveillante: “GOOD START”. America (with men still in the rigging) now decided to try to turn to port, to head in the same direction as were the French SOLs. That meant she would have to tack through the facing wind. So America turned to port, and then had to stop, as she was now “luffing” straight into the wind. America had used 6 Movement Points (MPs) in her previous turn, which meant she ordinarily would have had to use at least 4 MPs in this turn due to her deceleration rating of 2. But when a ship turns directly into the wind, it immediately stops. 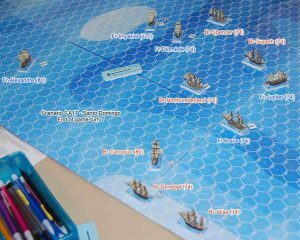 America moved another 6 hexes straight ahead, still angling to get in front of the French ships. The French ship Gentille, commanded by Mike St. Peter, moved “2P1” which meant it moved 2 hexes ahead, then turned 60-degrees to port, then moved 1 more space ahead. This put Gentille’s port bow adjacent to America’s port bow. Surveillante now also peeled out of the French line, plotting and moving “1P2”. 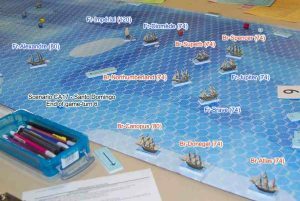 Eveillé and Ardent, both still with men in rigging, moved 6 and 5 hexes ahead, respectively. This was opening a bit of a gap between the two 64-gunned vessels. A note about combat in Close Action (of course, anyone who knows how to play Close Action will know this, but this blog post is mostly written for novices to follow along with play). Like, movement, ships simultaneously plot which ship they will fire at, if any. Then all ships will reveal their targets. Ships also calculate their MGN (Modified Gunnery Factor) and should also write that down. All gunfire (and marine fire) is considered to be simultaneous, and so each ship needs to know what its MGN was at the beginning of combat, as damage received can cause a ship’s gunnery to be lessened. America could now fire a half-(initial) broadside from its port bow battery at Gentille; Gentille suffered a rigging and a hull hit. Gentille’s initial (half) broadside from its port bow battery returned fire, but did no damage to America. Marine fire between the two ships was ineffective. During the maintenance phase to end the game turn, America drifted 1 hex to leeward (that’s downwind for you land-lubbers). Although America pivoted (turned), she did not move ahead, so that was considered that she did not move during the turn. Ships that don’t move during a game-turn are subject to drifting, and with high winds in a scenario like this one, they will drift more often than not. Situation at the end of game-turn 4. America was one hex further forward, but has drifted backwards one hex after exchanging gunfire with Gentille. Also, at the end of g-t 4, America announced it was now back at medium sail; Eveillé and Ardent also announced they were back at medium sail. HMS Bedford, the British flagship, sent a message to Adamant, saying “COME HERE FASTEST”. This message was sent, even though the flagship was still off the board (but would enter the game map the next turn). The French flagship, Eveillé, signalled to the French fleet: “ROUND SHOT AT SAILS”. America now rolled to see if she could successfully complete the tack to port this turn. After taking the required two d10 dice rolls on the tacking table, it was found that she did complete the tack, so her move for g-t 5 was plotted as “P”. She did have 3 crew sections plotted to help with the tacking maneuver, so her gunfire for this game-turn would have a -9 modifier applied (-3 per each missing crew section—they’re “missing” from manning the guns because they’re playing with the sails). Adamant plotted “3S2” and was now headed directly at the French, from dead-ahead of their SOLs. 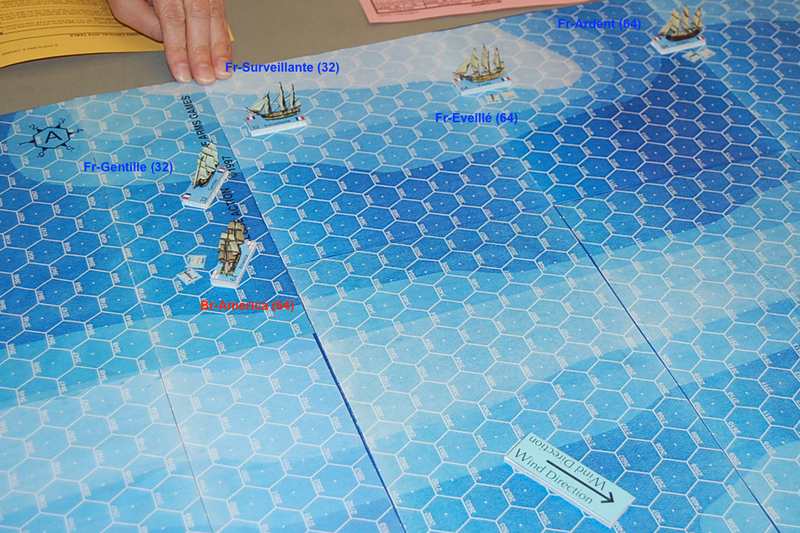 And the Bedford, a 74-gun SOL, was finally able to enter the board (in plain sail), moving 5 hexes towards the French. For the French moves, Gentille moved ahead 2 spaces, Surveillante moved ahead 3 spaces, Eveillé moved ahead 4 hexes, and Ardent moved “P2S,” to sort of side-slip a bit to the left of Eveillé. America fired at Eveillé, while the Eveillé, Gentille, and Surveillante all fired at America. America did no damage to Eveillé, but America suffered a combined loss of 1 rigging, 1 hull, and 1 sailor boxes. In addition, America suffered a critical hit of waterline damage, and had to send another 3 boxes of sailors to “man the pumps” to keep out the water below. This meant that America lost its first crew section, which gave it a permanent -3 modifier to all gunfire (from the main guns, not from marine fire). America also had to take a morale check (MC) at the end of the game-turn, but with a morale rating of “3” was able to pass the MC. Bedford (the British flag) signaled to Adamant: “MOVE TO JOIN AMERICA”. The French flagship, Eveillé, signalled to the French fleet: “FIRE EVERY TIME”. 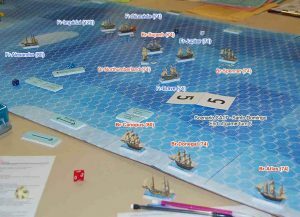 America having completed her tack during game-turn 5, was facing toward board edge “1,” and was facing directly toward Gentille. Not wanting to risk colliding with Gentille, America wisely plotted “0” and so did not move. Adamant, under plain sail, in a broad-reach attitude to the wind, raced along at 9 hexes toward the French. Adamant also had men in the rigging. 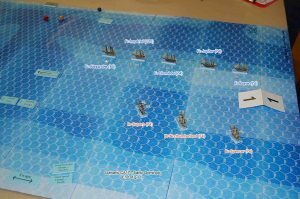 (Upon examination of the ships’ log for Adamant after the game, Adamant should have only moved 8 hexes, due to its acceleration of “2” and the fact it used only 6 MPs in the previous g-t.) Bedford, being close-hauled, moved 5 hexes towards the French. Gentille moved “1P2” which brought her port side up against the port side of America. Surveillante moved “P2S1” to gain a bow-rake on America. Eveillé moved 2 spaces ahead. Ardent moved 4 spaces ahead. America plotted to fire at Gentille; the other two British ships were still well out of range of the French. But America was in a sort of vise, drawing the fire of Gentille (1-hex range), Surveillante (2-hex bow rake), and Eveillé (9-hex range). After all gunfire was resolved, amazingly, America had only sustained damage to the amount of 2 rigging boxes and 2 hull boxes and 1 sailor box. Gentille sustained damage of 1 rigging and 1 hull box. The situation at the end of game-turn 6: British ship America is trapped between the ships of the French squadron. The French flagship, Eveillé, signalled to the French fleet: “FIRE AT RIGGING”. For game-turn 7, Adamant, still with men in the rigging, continued to make haste, moving 9 more hexes closer to the French. 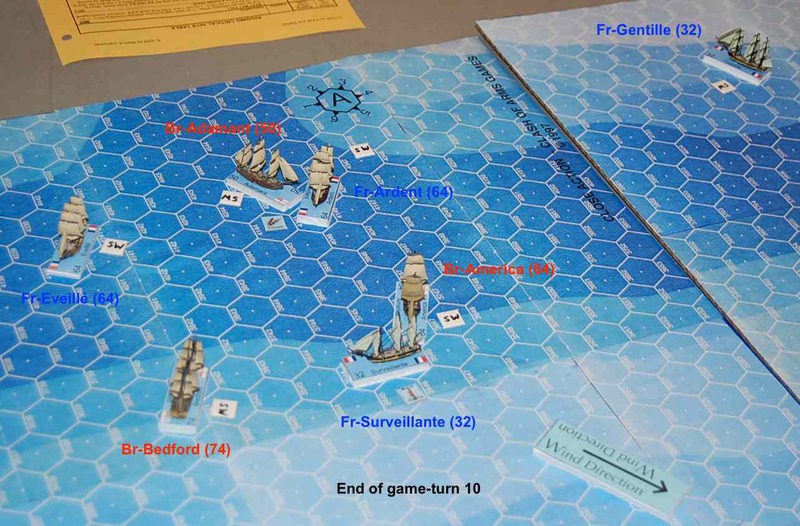 Bedford moved 5 hexes closer to the French, coming in from an angle. America, effectively not moving at all last turn while completing her tack, could only accelerate to 2 MPs, so she moved 2 hexes straight ahead. Gentille had been passing by America, so plotted “P1” to turn to port behind America and so gained a stern rake shot. Surveillante plotted “1S1” and so turned to starboard and was now on a parallel course with America, although slightly ahead, so Surveillante could still shoot her starboard stern guns at America. Although, in the end, Surveillante passed on the low-odds shot in order to not fatigue her gun crews for no result. Eveillé continued to move 2 hexes forward, and Ardent moved 4 hexes forward. Once again, America was the only British ship that could fire at the French, so America fired at Adamant, who was 6 hexes away on her starboard side, rather than take a 1-hex range half-broadside at Surveillante. Gentille, Eveillé, and Ardent all fired at America. America managed to inflict damage on 1 rigging and 1 hull and 1 sailor on Ardent. In return, America suffered damage of 1 rigging (losing her 1st rigging section and having to take a rigging check die roll, which resulted in “sheets cut”), and 1 sailor. So, in spite of having 3 ships firing at her, America dished out 3 boxes of damage while only receiving 2 boxes of damage in return. Perhaps more importantly, America was holding the French in combat, instead of them sailing toward the board edge they needed to exit from. At the end of the turn, Adamant announced she had changed to medium sail (from plain sail). Situation at the end of game-turn 7. Will America be able to escape the French trap? The French flagship, Eveillé, signalled to the Gentille: “TURN AROUND”. America now appeared to get entirely out of the French trap, as she only plotted “2” to move ahead 2 hexes. Bedford continued to close with the enemy by moving forward 5 hexes, and with men in the rigging. And Adamant, now at medium sail, moved forward 7 hexes. Gentille moved ahead 4 hexes. Gentille also had men in the rigging (sailor crew section 4), wanting to put up more sails to try to get back into the fight, as her sailing had now taken her a bit in the wrong direction. Gentille also had her marines working at repairing rigging. 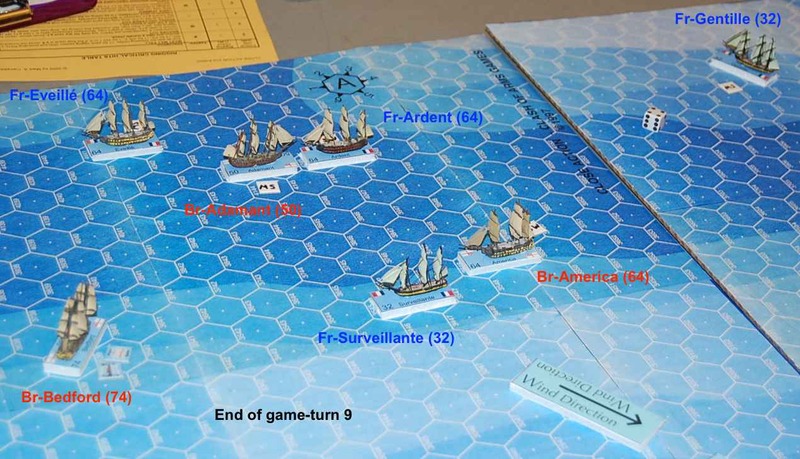 Surveillante moved ahead 2 hexes, keeping America on her starboard quarter. Eveillé moved ahead 2 hexes, and Ardent moved ahead 4 hexes. America set her marines to work at repairing her rigging. America once again chose to fire a full broadside at Ardent, rather than a half-broadside at the closer Surveillante. Neither of the other British ships fired. Ardent and Eveillé returned fire at America. America received only a “canvas wound,” i.e., a hit to a single rigging box, while America dished out 2 boxes of damage to Ardent, to a rigging and to a marine box. During the maintenance phase, Gentille switched from fighting sail to medium sail. America, having fired her guns 5 times, now added a -1 “fatigue” factor to all future gunnery. The French flagship, Eveillé, signalled to the French fleet:”CLOSE UP WHEN POSSIBLE”. America slowed to only 1 hex forward movement, while her marines were still working at repairing the rigging. (After the game, while perusing the ship’s log from America, she was repairing rigging while at medium sail. That is a big no-no! Ships must be at fighting sail or have their sails furled, or even dismasted, to be able to repair rigging! As a GM, I must check their logs more closely during the game.) Bedford got another 5 hexes closer to the enemy French, still with men in the rigging. And Adamant plotted “1S1P1” to sort of side-saddle move to starboard. Eveillé moved 4 hexes forward. Surveillante moved 2 hexes forward, which put America behind her starboard quarter so now neither of those ships would be able to fire at each other. Gentille moved ahead 4 hexes, then turned to port, directly into the wind, preparing to tack to a new course. Gentille had effectively sailed completely around America (the ship, not the country!). Ardent continued moving ahead, 4 more hexes worth. This put Ardent on a direct collision course with Adamant! They were facing each other in adjacent hexes. 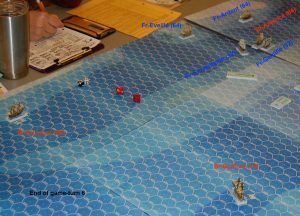 America again targeted Ardent, and now the HMS Adamant opened fire on Surveillante. Ardent returned fire at America, and Eveillé fired at Bedford. Ardent received a hull hit, while Surveillante was unscathed. America sustained a hull hit, and Bedford dodged any damage. End of game-turn 9: HMS Adamant and the French SOL Ardent are on a collision course! Bedford dropped from plain sail to medium sail during the maintenance phase. The French ship Surveillante signalled to the French fleet:”FIRE AT HULL”. The first order of business for game-turn 10 was to resolve the possible collision between Adamant and Ardent. Ardent made a turn to port, which was prudent, as if she had turned to starboard she would have turned into the wind and would have lost all headway. So, one would have thought that the captain of Adamant would have realized this and so would have turned to port, but instead the Adamant turned to starboard, and that put the two ships on a collision course, only in a different hex! 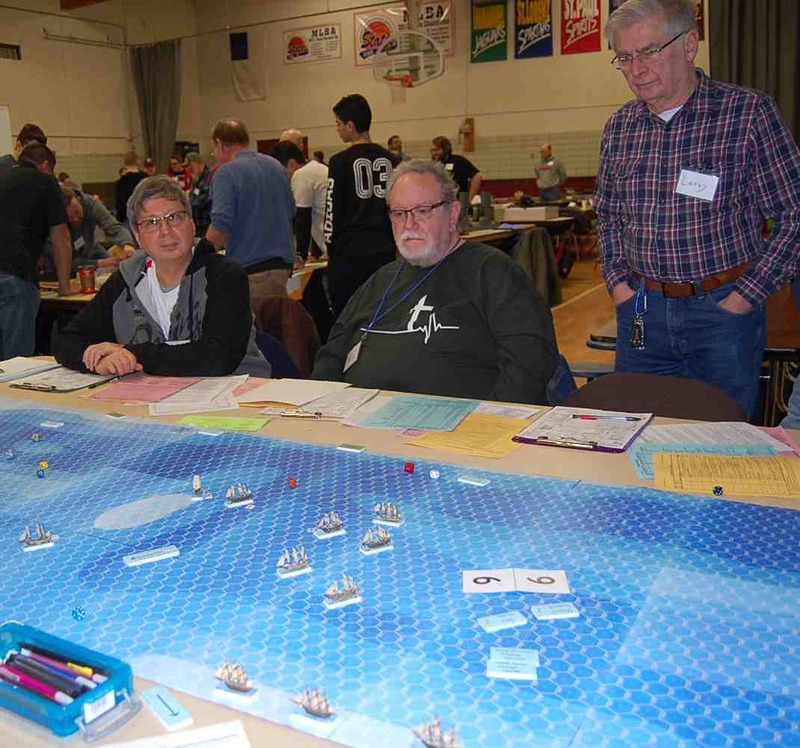 Besides gnashing of teeth, there was dice-rolling to see which ship got to move first and take possession of hex A4145, and it was the French ship Ardent that got to move first into A4145. Now, sometimes, a ship can attempt to “bear off” by making an emergency turn in a game of Close Action in order to try to avoid a collision. But in this case, since Adamant had just made a turn, and had plotted to move “S1P1S” (which was also an illegal plot, as ships cannot pivot more than twice in a game-turn), she could not turn again immediately. Instead, she rammed into the starboard bow of Ardent. In Close Action, the ramming ship takes damage to its sails, depending on how many sails are flying, when it rams another ship, but the ship that is rammed into does not get any damage. So, in this collision, Adamant lost 5 rigging boxes. That wiped out Adamant’s entire first rigging section (of 5 boxes), necessitating a rigging check, which took out two more rigging boxes in rigging section 2. And, to top things off, the two ships became fouled together, so neither would be able to move away from the other. For the other ships’ moves, America moved 2 ahead then turned to port. As Surveillante only moved 1 hex ahead, that put Surveillante in position for a bow rake on America. Bedford moved “S2P” and had a bow rake shot on Surveillante from 4 hexes distant. Gentille rolled dice to attempt to continue tacking to port, but the tack’s completion would be delayed for a turn, so Gentille stayed facing into the wind. 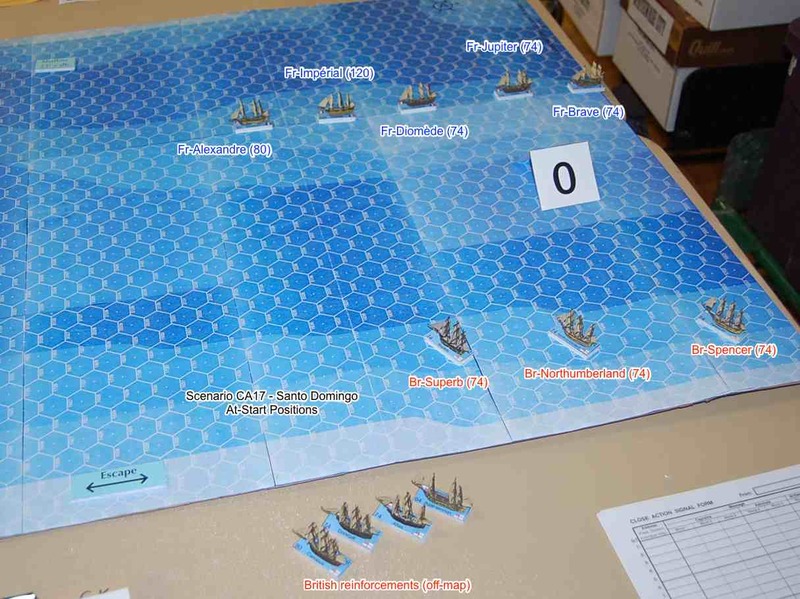 Eveillé turned to port and then moved 3 hexes ahead, which put her in position for a 9-hex ranged shot versus America, although in the event Eveillé instead fired a half-broadside at range 5 versus Adamant. During combat, America fired at Ardent, and Bedford fired its initial starboard broadside with a bow rake at Surveillante. The French returned fire with Surveillante firing its half-broadside bow rake at America, and Eveillé and Ardent both shot at Adamant. America suffered only 1 hull hit, but Adamant took a pounding, losing 3 hull and 4 sailor boxes, to go with the 7 rigging boxes Adamant lost during movement. Losing the crew section triggered a morale check for Adamant, which she failed, dropping her crew quality to “E” which also yielded a “-2” to future gunfire. Surveillante lost only 1 sailor box, and Eveillé lost 2 rigging boxes. Situation after game-turn 10. Adamant has rammed and fouled with Ardent. The French ship Surveillante signalled to the French fleet:”GO DOWNWIND ENEMY”. Gentille completed its tack, and simply pivoted to port. It drifted later (1 hex downwind), during the maintenance phase. Surveillante moved 3 hexes forward. Eveillé moved 6 hexes forward. Ardent was still fouled with Adamant, so neither of those ships moved. America merely moved 1 hex forward, which put her in position for a 3-hex range stern rake of Surveillante. Bedford moved “1S1P” which put her stern in position to be raked by Surveillante. Bedford would return fire at Surveillante, but could only use her starboard stern battery. Eveillé fired at Bedford, but could only use her port stern guns. Ardent delivered another bow rake on Adamant, but this time, Adamant returned fire with her port bow guns. Adamant lost 2 rigging, 2 hull, a sailor, and a marine box. Bedford lost a hull and a sailor box. Surveillante lost 1 rigging, 1 hull, 1 sailor, and 1 marine. Losing the sailor meant that Surveillante lost her entire first crew section, so future gunfire would have a -3 modifier, and she also had to take a morale check later in the turn (which she passed, having a morale rating of “4”). Ardent lost a rigging, a hull, a sailor, and a marine, although no full sections were lost (yet). During the maintenance phase, Gentille drifted, as did the fouled duo of Adamant and Ardent. The French ship Surveillante signalled to the French fleet:”RUN OR FIGHT”, evidently wanting to know what the admiral wanted the French to do. At the same time, the French flagship, Eveillé, sent aloft the signal flags that stated “SHOOT AT AMERICA”. Now the French 64-gun Ardent began to worry. It was still fouled to Adamant, and now Bedford was closing in for a bow rake on Ardent. Bedford moved “1S2” but was only in position to rake the Ardent with her port bow guns. America moved 3 spaces ahead, moving once again in uncrowded water. Gentille accelerated at her maximum rate of “2” and so moved two spaces ahead after finally completing her port tack. Surveillante moved 5 spaces ahead to move away from the nearest British ships, and Eveillé moved 6 spaces ahead. America fired at the retreating Surveillante at 8-hex range, too far for a rake of the Serveillante’s stern. Adamant, still fouled to Ardent, fired her port bow battery at Ardent. Bedford also fired her port bow guns at Ardent, a half-broadside bow rake. Ardent was the only French ship to return the British fire, firing a 1-hex range bow rake at Adamant. Surveillante took only 1 hull hit, but Ardent got pummeled to the tune of 3 rigging and 3 hull. Adamant lost 2 rigging (causing the loss of her 2nd rigging section), 1 hull (causing the loss of her 1st hull section), and 1 sailor (losing the 2nd sailor section). So, Adamant had to take another rigging check, a hull check, and two morale checks. In addition, she added a -1 modifier for “guns dismounted” from both the port and starboard broadsides, and all gunnery also got a second -3 modifier for the extra missing crew section (making the “missing crew” gunnery modifier -6 in total). Damage was really beginning to add up against the Adamant. During the maintenance phase, the Adamant kept trying to grapple the Ardent, to keep her from being able to sail away, especially now that the Bedford was coming up to aid the Adamant. Although the grappling attempts kept failing, the Ardent was also unable to unfoul the ships, and so couldn’t get away. The French flagship, Eveillé, signaled “CLOSE UP UNTIL GENTILLE” to her squadron. The British flagship, Bedford, signaled to the ship America “TARGET FRIGATE IF POSSIBLE”, but did she mean the retreating Surveillante or the approaching Gentille? The British Adamant and the French Ardent were still fouled together and so couldn’t move, and now Bedford moved 2 spaces ahead to have a better bow rake on Ardent. America moved 3 spaces ahead, not sure whether to go and help finish off Ardent or to pursue the Surveillante and Eveillé. Eveillé turned to starboard and then moved 3 spaces directly toward the board edge where she could escape from the British. Surveillante turned to port and moved 2 spaces ahead, so she would be able to shoot at America. Gentille accelerated to 4 MPs, and moved straight ahead. For the combat phase, America and Surveillante traded broadsides, although Surveillante, being only a 32-gun frigate with a missing crew section and whose remaining crew was slightly fatigued, could only manage a MGN of “0” (zero), to which of course a 1d6 would be added. Ardent continued to bow rake Adamant, and while Adamant returned fire at Ardent as best she could, Bedford now had a full 1-hex range bow rake on Ardent. America managed to hit a single sailor box on Surveillante; the return broadside did no damage. Ardent’s bow rake at Adamant caused damage to 3 rigging, 1 hull, and 1 sailor. The return fire from Adamant and Bedford to Ardent caused damage to 1 rigging (taking out rigging section 1 and causing a rigging check), 2 hull (wiping out hull section 1 and causing a hull check and a morale check), and 2 sailor boxes. The end of game-turn 13. The French ship Ardent is now caught in a vise between Adamant and Bedford. Eveillé has moved to the left, out of the picture, and Surveillante also has a clear path to escape to the left. Gentille, at the top-right of the picture, should be able to cruise past Adamant and Bedford to escape. During maintenance, Ardent still was unable to unfoul from Adamant, meaning Ardent was in a very precarious position. The British flag in Bedford sent the message to all British ships, “FOCUS ON ARDENT KILL”. I guess you can’t make it any plainer than that, that you want to wipe out an enemy ship! 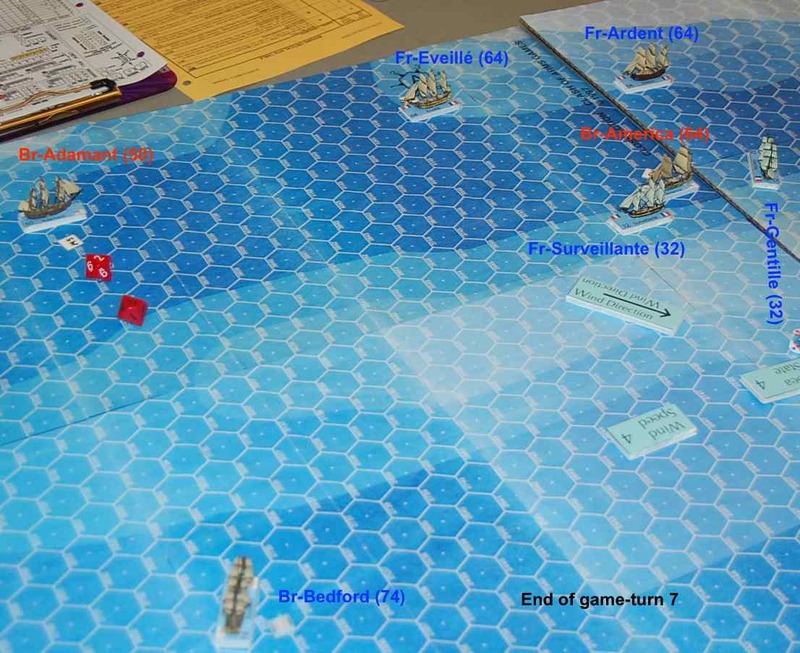 During game-turn 14, the French ships Eveillé and Surveillante continued to move toward the escape map edge. Eveillé moved 4 hexes straight toward that map edge, and Surveillante moved 7 hexes while on a broad-reach, in the general direction of that map edge. Gentille accelerated to “5”, the most speed she could go while close-hauled with medium sails. She also had men in the rigging, trying to raise more sails, although that would take two turns to accomplish. For the Brits, America merely moved 2 spaces ahead. Adamant was still fouled with Ardent and so couldn’t move, and Bedford did not move at all, so to keep the perfect bow rake position on Ardent. Only two ships fired during combat: Ardent had a bow rake on Adamant, and Bedford had a bow rake on Ardent. But, it seems, the game was ended just at this moment, as no damage was recorded for game-turn 14. The French did not fulfill their special victory condition of exiting all four of their ships off a particular map edge, so the scenario would be decided by damage inflicted upon the enemy. America (worth 72 Victory Points) lost 7 rigging boxes (1 was then repaired), 5 hull boxes, 6 sailor boxes, and 1 marine box. She only lost one rigging section, though. That rigging section was worth 5% of her total VPs, so the French earned 3.6 VP for America. Adamant (worth 45 VP) lost 14 rigging boxes, 7 hull boxes, 7 sailor and 1 marine boxes, which was a loss of 2 rigging sections (2 x 5% of VPs), 1 hull section (10% of VPs), and 2 sailor sections (2 x 10%). So Adamant was worth 40% of her 45 VPs, or 18 VP. Bedford (worth 70 VP) lost only 1 hull and 1 sailor box, and no sections, so she yielded 0 VP to the French. So the French amassed a total of 18 + 3.6 = 21.6 VP. Gentille (worth 28 VP) lost 2 rigging boxes, 2 hull boxes, and no sections, so she yielded 0 VP to the British. Surveillante (worth 27 VP) lost 2 rigging boxes, 2 hull boxes, 3 sailor boxes (1 crew section), and 1 marine box. So her 1 crew section was worth 10% of her VP, or 2.7 VP. Eveillé (worth 62 VP) lost 2 rigging boxes only (no sections were lost), so she yielded 0 VP. Ardent (worth 62 VP) lost 6 rigging boxes (1 rigging section), 8 hull boxes (1 hull section), 4 sailor boxes, and 2 marine boxes, so her 1 rigging section is worth 5%, and the hull section is worth 10%. So 15% of 62 = 9.3 VP. So the British earned 12.0 VP from the French. The French had a VP lead of 21.6 to 12.0, so on the face of it, the French earned a slight victory. 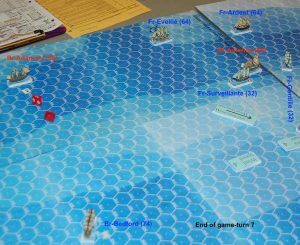 However, if the scenario had continued, I believe that Ardent would have eventually surrendered, or would have been battered to pieces, so I would say that the British won this scenario as it seemed the other three French ships were mostly concerned with getting away. The other French ships could have come back to help Ardent, but by the time Eveillé could have turned around and come to Ardent’s aid, Ardent would have not been in very good fighting condition. British ship Bedford still had all of its gunnery factors; if it continued to pour in bow rakes at Ardent, it would usually have a BGN of close to 30 from 1-hex range. Even at 5-hexes, Bedford’s BGN would be just more than 20. Firing 30 (plus the d6 die roll) gunnery factors should inflict 4 to 7 points of damage per turn. Firing 20 (+ d6) factors should inflict 1 to 3 factors of damage per turn (not counting any critical hits, of course). However, the other British ships were not in great shape. The Adamant would have to apply -10 or -11 to all of her shots, and maybe more negatives. America had a total of -6 or -8 in modifiers, but she still had a Crew Quality of B, so that added +4, making the total gunnery modifier only -2 to -4. So America would have been able to make some effective gun attacks versus Ardent. But Ardent wasn’t in any immediate danger of being boarded and captured. At the time the scenario was suspended, Ardent still had 17 sailor boxes and 3 marine boxes, more than enough bodies to repel boarders. But she would probably lose those bodies at the rate of 1 or 2 boxes per turn of gunnery fire against her. Of course, Ardent may have been able to unfoul from Adamant, and if Bedford drifted away, then Ardent could try to make a run for it. 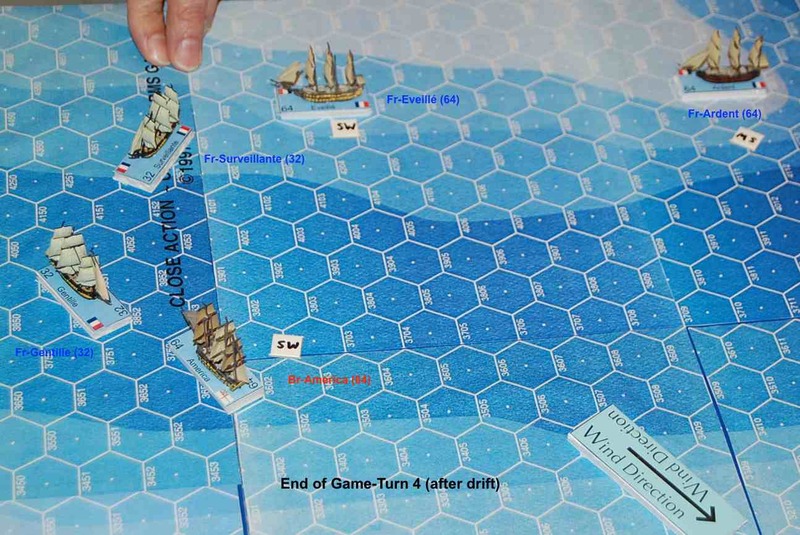 But Ardent had lost one rigging section, so she then couldn’t raise sails any more than medium sails, meaning that if was sailing close-hauled toward the exit map edge, she could only move 3 hexes per turn. If Bedford stayed with medium sails, she could move 4 hexes close-hauled, and so could catch Ardent. Although, America had lost one rigging section, and so her fastest speed while close-hauled with medium sails was also only 3 hexes. And Adamant had lost 2 rigging sections, so could only make 1 hex per turn while close-hauled, as she could only fly fighting sails. So, perhaps Ardent could have escaped? I have all of the logs, maybe some day we can get some folks together and play out the rest of the scenario? This was a sort of hectic scenario, in that we only got 14 game-turns played (well, we got 13.5 game-turns completed). We would have liked to have played 30 game-turns or so, but we had three players who were new to Close Action. And one of them arrived to play after we had started the scenario, and so Joel and myself (mostly) were trying to explain the game to him. As the GM, I was also trying to take lots of notes and pictures to help with this write-up, although I forgot to take pictures after some of the game-turns. And that record-keeping slightly slowed up play, also. Some of the logs were not filled in correctly, but that is to be expected, especially with novices playing. One of my goals of running Close Action scenarios is to educate folks how to play the game, so we will have a larger pool of experienced players available so we can try to (eventually) play some of the larger scenarios. There were also two times where captains had crew working at repairing rigging damage, but the ships were at medium sail. I will have to remember to check the status of ships’ sails during rigging repairs in the future. But there are bound to be mistakes, especially playing at a game-con where you have a limited amount of time. We had four hours available for this scenario, but probably 30 minutes of that was used in explaining things to new players at the beginning, and the “command conferences” where each admiral explained their plan to their subordinate captains of course took some time. 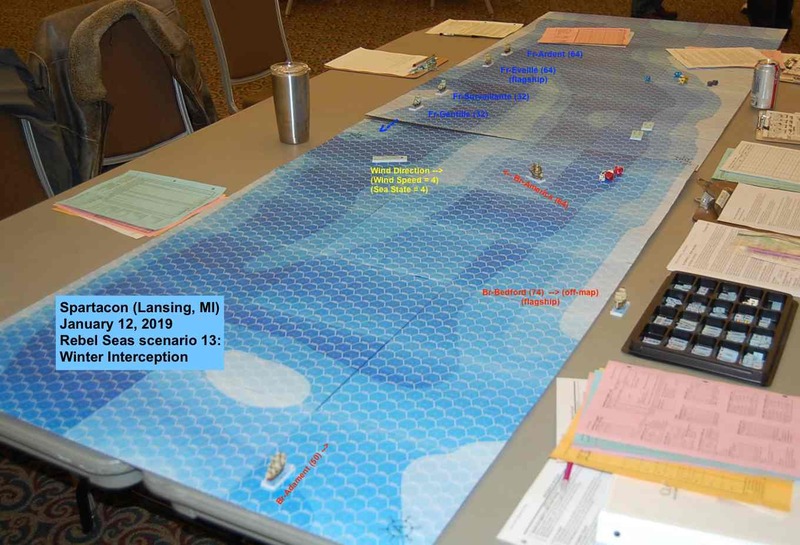 I am running another scenario of Close Action at Flintcon in Flint, Michigan, on Saturday, February 9, 2019. The Close Action game will begin at 0900 (9:00 am for land-lubbers) and will run until 1300 (1:00 pm). The game con is at St. Paul’s Lutheran Church and School, 402 S. Ballenger Highway. The scenario is “Santo Domingo,” Close Action scenario 17. 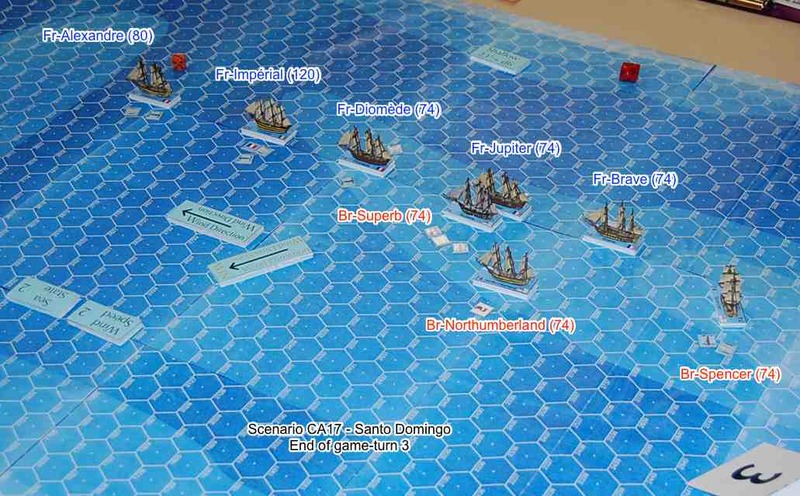 Five French ships are trying to escape from seven British ships, although only three British ships are on the map at the beginning of the scenario (the other five Brits enter later as reinforcements). So up to 12 players can play! Come and check it out!